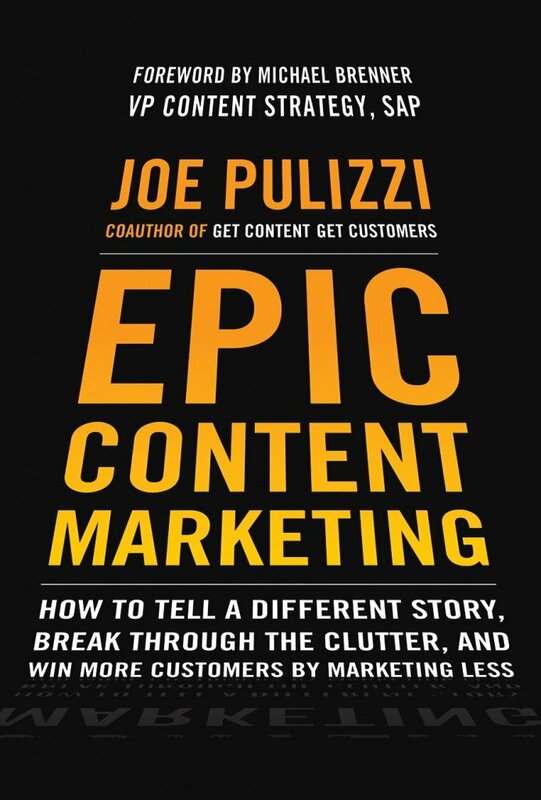 Editor’s Note: The following is an excerpt from Joe Pulizzi’s new book Epic Content Marketing: How to Tell a Different Story, Break through the Clutter and Win More Customers by Marketing Less (McGraw-Hill, 2013). We also had the opportunity to interview Joe, and following this excerpt is the exclusive Q&A between Joe and Jay Baer. Enjoy! These seven tips will create a powerful concoction that will be hard for any company, including media companies and your direct competitors, to compete with. Remember when eBay was the online auctions king? Well, today, online auctions are just 10 percent of its total business — its payment and mobile business is half the company. eBay is betting its entire future on mobile, and it’s winning. And heck, right now, 32 percent of “Wall Street Journal” website traffic comes from a mobile device (60% from a smartphone and 40% from a tablet device). Most media companies either have legacy systems in print or (I can’t believe I’m saying this) digital. Yes, digital, as in desktop publishing, is becoming a legacy system. Responsive design has helped (responsive design basically takes your “desktop” content and makes it perfectly readable on a mobile device), but this is a band-aid, in my opinion. You need to plan, right now, for the inevitability that the majority of the traffic to your content marketing will come from a mobile device in two to five years. This means thinking mobile first as part of your channel strategy. Because of how media companies are built and the content processes and staffing they have in place, you can move faster to a mobile first strategy than they can. Companies like GE, Avaya, Monetate, and more have all filled key marketing positions with journalists and editors from media companies. This is now the rule and not the exception. Why shouldn’t you do the same? Todd Wheatland, Head of Global Marketing at Kelly Services OCG, doesn’t create content every day, but when they have a story to tell, they maximize it. Todd’s goal is to create 20 pieces of content (think SlideShare presentations, videos, blog posts, white papers, etc.) all from one story idea. So, the next time you begin a story concept for your content marketing program, set your heights on Kelly’s model. As content marketers, our goal is to own our media channels, just like publishers do. A strategy that never fails is the “rent-to-own” model. This means partnering with media companies through webinars and sponsored content opportunities to get your content in front of their audience. The goal is to “convert” these prospect readers into your readers. 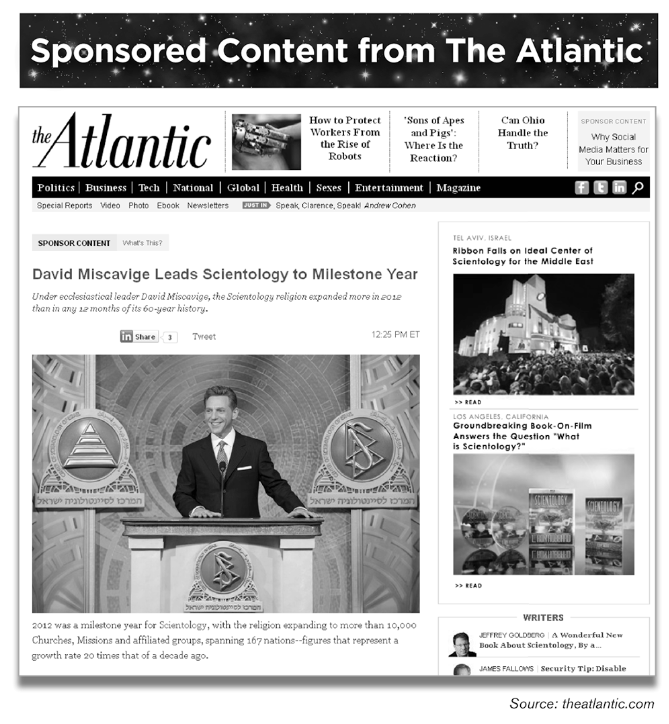 With publishing models crumbling, most media companies are happy to partner with you on any number of rent-to-own strategies (just don’t do what the Church of Scientology did with The Atlantic… make it helpful content, not propaganda). Many brands today are leveraging employees and outside influencers as part of their content marketing programs. While I believe this is good, I see a gaping void in the editorial arena. Simply put, brands are not investing enough in editorial and proofreading as part of their processes. Every piece of content you create should have at least two sets of additional eyes on the content. In addition, your employees may have the stories, but may not be storytellers. Assign an editor to help them tell a story that works for your content marketing program. Do an analysis on the media companies in your industry. Have a team discussion about which ones are the best fit for your content marketing program. Consider purchasing that media company (yes, that goes for you smaller businesses as well). As a media company, Content Marketing Institute does everything it can to commit to the reader experience. That said, most of our bills are paid by our sponsors. It’s a challenging juggling act. As a brand, you don’t have this issue. Leverage it. Commit your stories to one epic concept — what’s in it for them, meaning the reader (aka, your customer). This is your critical advantage, where you can focus all of your attention. Jay: You recommend that brands hire professional writers. But for smaller companies that may not have a full-time role available, can they “rent” professionals? If so, what should their duties be? Joe: Of course. Hiring a managing editor is a critical component to make sure you are publishing “rock star” type content. Look for bloggers in your industry to help, or review the masthead for the leading trade magazine in your industry who are freelancers. Most of them will be looking for new opportunities (to help companies like yours). An SEO expert to make sure all your content plumbing is working as it should. Editors to review your content assets to see what’s usable and what isn’t for your content marketing. Content strategists to help make sure your strategy is on point and that you are truly being helpful with your content AND accomplishing your marketing objectives with your content. Jay: In terms of adding editorial processes to content created by employees and fans, are you suggesting that editors create and assign content to these folks, or just that the company invest time to make sure the content created isn’t total crap? Joe: Let’s face it…most of your employees probably aren’t good content writers. You can do with Openview Venture Partners did to create their famously successful site, Openview Labs. They hired a content marketing manager (editor) that worked with their employees and management to take the expertise of employees and put it into “story form”. Whether you insource or outsource this role, it’s key that your content goal be to become “best of breed” in your industry niche. Your customers have so much content out there that can be helpful. Why should they be interested in you? Make sure you set an editorial calendar that positions your brand as the go-to informational resource. Jay: Do you believe some sort of content marketing software is becoming required to do this well? Joe: For low-tech businesses, an excel spreadsheet, a content management system like WordPress (for your blog) and a solid email provider is really all you need. But there are a lot of amazing technology solutions out there that can help. For production, look at DivvyHQ, Kapost or InboundWriter. For curation, look at PublishThis or Curata. For content management, look at something like Compendium. For content distribution, look at Disqus, Outbrain, PRNewswire or Taboola. For marketing automation, look at Marketo, Eloqua Oracle or Act-On Software. For crowdsourcing, look at Crowdsource. If you are really interested in the technology of the space, check out this report where CMI briefed 13 technologies. Jay: When you say “commit your stories to one epic concept” do you mean to narrow the topical focus of what you are publishing about in your company? Don’t most companies (perhaps incorrectly) take the content marketing position that their “epic concept” is to convince you to part with your money? Joe: Ah, you are so right. The first step with Epic Content Marketing is to understand that your customers don’t care about your products and services at all. It’s tough to swallow, but critical to this whole thing working. Customers care about their own needs. That’s where you need to find your story or stories… around a concept so truly niche that you can actually be the world’s leading expert in that area. Most brands try to boil the ocean with their content. Don’t fall into that trap. Find a content niche that you can realistically make that happen. For example, we did this in the content marketing niche in 2007. Today, content marketing would be too broad (we would need to focus on financial content marketing or content marketing for non-profits to truly be successful). Go big by going small. Jay: I’m fascinated by your advice that even small businesses think about making a media company purchase. Do you have an example of a small company that has pulled this off successfully? Joe: Big “non-media” brands are really starting to do this, as evidenced by Google buying Zagat and Frommer’s in the past few years. But a smaller company example that I love is JPG magazine, the user-generated photo magazine, was about to go out of business… until… camera supply company Adorama became the lead investor in keeping them afloat. It was a perfect marriage for both… and now four years later JPG is still going strong. Here is the article about how that happened. I think we are going to see more of this in the future… and there are plenty of opportunities. Joe Pulizzi’s third book, Epic Content Marketing: How to Tell a Different Story, Break through the Clutter, and Win More Customers by Marketing Less, was just released. Epic Content Marketing takes business owners and marketers A-to-Z toward creating a content marketing strategy that works to grow the business. Joe is also founder of Content Marketing Institute, the leading education and training organization for content marketing, which includes the largest in-person content marketing event in the world, Content Marketing World. You can find Joe on Twitter @JoePulizzi. If you ever see Joe in person, he’ll be wearing orange.